This entry was posted on Sunday, November 16th, 2014 by Frances Ryan. Yesterday marked one calendar year since I matriculated as a research student in the Institute for Informatics and Digital Innovation at Edinburgh Napier University. It’s hard to believe that more than 15 years after first thinking about a PhD, I’m finally making progress on one! I wish I could tell you that it’s been an easy road, but the journey has been a long and twisting one—both the part leading up to my matriculation and steps from then to now. The longest road was the one leading to the starting line. It included twists and turns that delayed my master’s and PhD. Some of them were good, happy delays (I met a man and got married!). Some of them were sad, tragic delays (my husband died a few months before my initial post-graduate plans were meant to begin). But I got there in the end. Eventually. Though slightly battered and scarred. In the months leading up to my initial PhD acceptance and the actual start of a different PhD, I found myself excited about my future once again. I envisioned this wonderful journey where I would ease into my studies with a nice man beside me, and all would be wonderful. But then the nice man turned out to be a not nice man. And the visa process I needed to go through before starting the programme took an extended amount of time. And my self-esteem took several hits when people reminded me that I wasn’t smart enough to get an education. But I’m stubborn, so I persevered. I went into the process last November with the notion that most of my first year would be spent reading, reading, and writing. I also went into it knowing that there would be training and learning opportunities. And, as I often do, I went into it knowing that there would be moments when I wondered if I was good enough. There have been some definite highs in the last year. But, unfortunately, there have been a few self-inflicted lows because of the aforementioned self-esteem issues. Even more unfortunately, some of the self-esteem issues stem from the comments of others. Academically, I struggled with knowing how to start (a common PhD affliction, I understand). I also struggled with grappling with my literature review (another common affliction). Personally, I struggled with trying to re-start my dating life. I also struggled with the negative comments of others who still don’t think I’m clever enough for a PhD. I can honestly say that, one year into my PhD, life is nowhere near what I imagined it would be—from either a pre- or post-widowhood vision. But it’s a life. And it’s my life. No matter how crazy and unsettled it may be. My lovely PhD dreams have morphed into hellish nightmares a few times over the last 15 years, but dreams do that from time-to-time. And I expect that over the next two years, as I struggle with the ups-and-downs of doing a major research project, there will be a few nightmare moments once again. So, here’s to one year done and dusted. 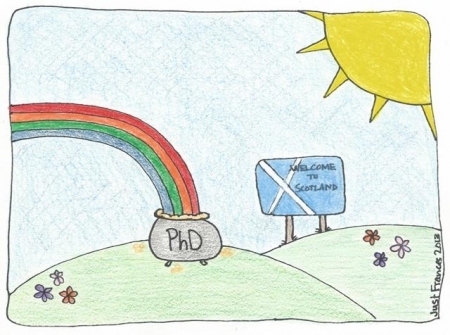 You can read a bit more about my PhD journey on my PhD blog—or by checking out the PhD dreams section of Just Frances. And you’re always welcome to offer me support and encouragement on either platforms. But for now, it’s back to this celebratory glass of wine. * I struggle with “home” as an expat, but a wise friend once said that even though Cle Elum is my Homeland, Scotland will always be my Heartland. Yeah, I like that.